Xexyz, known in Japan as Kame no Ongaeshi - Urashima Densetsu (亀の恩返し〜ウラシマ伝説〜, Kame no Ongaeshi - Urashima Densetsu? lit. Repayment of the Turtle, the Legend of Urashima), is a 1988 action game by Hudson Soft for the Famicom and NES. The game was released in Japan on August 26, 1988, and saw a North American release sometime in April, 1990. The game was never released in Europe. 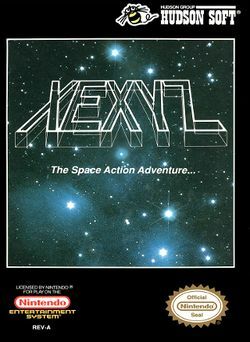 The game centers around the main character Apollo, who progresses through the game in an alternating format that switches between platform, side-scrolling action and side-scrolling shooter action. The goal of the game is to destroy an evil boss known as Goruza, rescue Princess Maria, and save the planet. In the platforming levels, defeated enemies drop life ('L' blocks) or money ('E' blocks) powerups. Apollo collects the E blocks in order to exchange them for power-ups and information, as well as access to minigames. Vendors are scattered throughout the platforming levels through doors or hidden gates. In the shooter levels, the player can find 'S' and 'P' power-ups which upgrade speed and weapons, respectively. The American version differs from the original Japanese version on a few levels, primarily cosmetic, but leaves a majority of the game play in tact between both versions. While the American back-story is a generic one, the Japanese version is intended to be an updated version of an old Japanese legend about Urashima Tarō. Tarō is a fisherman who rescues a turtle and is rewarded for this with a visit to Ryūgū-jō, the palace of Ryūjin, the Dragon God, under the sea. He stays there for three days and, upon his return to his village, finds himself 300 years in the future. In Kame no Ongaeshi, the player is a descendant of Urashima who saves a turtle which asks him to travel to a far away place in order to rescue a princess. This page was last edited on 26 May 2018, at 09:06. This page has been accessed 6,012 times.